These clever storage baskets are not only cute and handy, they're also a secret recycling project. The sides and bottoms of each basket are stiffened with recycled cardboard! But wait ... they have another hidden talent: they collapse and fold flat to store. In the nursery, use them for creams, diapers, wash cloths and other diaper changing accessories. You could fill a whole shelf set with bright and beautiful baskets. And yet, why let the nursery have all the fun? We bet you have a lot of cardboard just waiting to be recycled. I see bread baskets and mail baskets and gift baskets ... oh my! Our sample was made for a baby girl's nursery, using the stunning Patty Young Andalucia collection. For information on where to buy, read Stylish Baby Nursery: Designing with Bold Colors & Patterns. This article also includes suggestions for creating an alternate fabric palette that would work well for a boy's nursery. We're going to use a leather machine needle in this project - even though our supplies don't call for leather. A leather needle is a super sharp, heavy-duty needle for sewing through difficult materials. Leather is one example; we're using it for this project to sew through the cardboard that makes the sides of the boxes. Using your see-through ruler and chalk pencil, cut a 7½" x 9½" piece of fabric from Fabric A. Then, cut a strip from Fabric A that measures 6½" x 33". These pieces will form the bottom and outside walls of the box. Cut two strips from the binding scraps that each measure 1¾" x WOF (width of fabric). We'll use this for the binding of the box – the fabric around the top and bottom edges of the box. From Fabric B, cut one 7½" x 9½" piece and one 6½" x 33" strip. These will cover bottom cardboard insert and the inside walls. Four pieces that measure 6" x 3¼"
Two pieces that measure 6" x 8¾"
One piece that measures, 6½" x 8½"
Fold the 6½" x 33" piece of Fabric A (outer fabric) in half, with right sides together, and stitch up the 6½" side, using a ½" seam allowance. Turn right side out and press seam open. Using the 6½" x 33" piece of Fabric B (inner fabric), repeat step one. Place the sewn Fabric B piece inside the sewn Fabric A piece, placing them WRONG sides together and matching up the seam lines. Pin the bottoms of the two pieces together, and stitch around the bottom, using a ½" seam. Stitch a vertical seam along each drawn mark. You should now have a total of six sewn vertical seam lines that join the outer fabric and the inner fabric with the wrong sides together. These vertical seam lines have created 'capsules' where we will insert the cardboard to make the box stand up. Quite smart, no? With the wrong side facing up and the edges of the fabric inside the box, pin the 7½" x 9½" piece of Fabric A to the 'walls' you just made. This creates the box bottom. Align the corners of this bottom piece with the vertical seams on the wall, line up your raw edges, and match long sides to long sides and short sides to short sides. The raw edges of the fabric should extend to the outside of the box, and when you look into the box you should see the wrong side of the bottom fabric. Stitch all around, using a ½" seam. After attaching, carefully trim the seam allowance to ¼" – we will be absorbing this raw edge into the binding in the steps below, so we want to reduce the bulk as much as possible. Next we will create the binding for the bottom of the box. Find on of your 1¾" x WOF strips and trim to 1¾" x 34" (this is the perimeter of the box plus 2" for a tail we'll use to finish our binding neatly). Fold the strip in half lengthwise and press. Now fold the raw edges in toward the middle lengthwise seam line, and fold together. Press. (Your raw edges are now inside the binding strip. Repeat to create your second binding strip for the top. Set this top piece aside. Remember, you can choose to use either matching or contrasting fabric for the binding; you could even make the top and bottom bindings out of different fabrics. Pin bottom binding strip to the bottom of the box, encasing the raw seam allowance inside the fold of your bias tape. Carefully pin. Stitch binding in place, keeping your seam line a "scant" (very small) ¼" in from the bottom folded edges, but still being sure to catch both sides of the bias tape in the seam. Stitch all the way around the perimeter of the bottom, but stop about 1" from the end for finishing. We cut our original binding piece about 2" longer than the perimeter (step #1 above), so you should have a slight tail at the end of your binding. Trim this to about 1-1½" (enough to overlap the start of your binding by about ½"). Fold under the end of the tail to create a clean edge and wrap around the start of the binding. Overlap about ½" and stitch in place, matching your seam line. Be sure to backstitch at the end of the binding to secure it in place. Insert the cardboard pieces between the vertical seam lines to stiffen the walls of the box. Switch the regular sewing needle currently in the machine to the leather needle. Pin the other binding strip to the top of the box, encasing the raw edges and the top of the cardboard inside the binding. Stitch a 'scant' (very small) ¼" in from the edge of the binding.We are using the leather needle for this step because it is extra sharp and heavy duty for sewing through the cardboard. Attach the binding, following steps 4 and 5 above. Stitch slowly - your machine is working very hard to get through the thick cardboard - sort of like running uphill. You may find it helpful to lengthen your stitch length a bit at this point, so your machine can get the job done in less stitches. Lay the 6½" x 8½" cardboard piece on the wrong side of the 7½" x 9½" piece of fabric B. Fold the edges of the fabric over the cardboard, being careful to keep the fabric tight on the corners. Press in place and stitch (you're stitching through fabric and cardboard again so you should still be using the leather needle in your machine) around all sides to secure the fabric to the cardboard. Stitch close to the raw edge of the fabric so it will lay nice and flat. Press again after stitching. Insert the fabric covered cardboard into the bottom of the box, with the fabric side facing up. To collapse the box, simply remove this bottom insert; the short sides will fold in between the cardboard panels, and the whole thing will fold flat for storage. You can adapt the instructions above to any size box. First, determine the size you want the finished box to be, and cut the fabric to: the perimeter of the box plus 1/2" all around (for the seam allowances) x the height you want the finished 'walls' to be. Cut one piece of fabric for the outside and one piece of fabric for the inside. Determine where you want the corners of your box, and stitch four vertical seam lines in those locations. Divide the seams on the SHORT sides in half, and stitch another seam line in this location (this allows the box to 'collapse' when you take out the bottom insert). Once you know where the corners of the box will be, you can cut your bottom fabrics to the appropriate size. You'll need two pieces: one for the box bottom (add ½" all around for the seam allowance) and one for the cardboard bottom insert (add ¾" all around to give you enough fabric for folding over the cardboard). Then cut two pieces of binding long enough to fit the perimeter of the box plus about 2" for finishing. Cut cardboard for sides to size to fit in the 'capsules,' and sew everything together. Just remember, the bigger the box you hope to create, the stiffer the cardboard will need to be to support the sides and the contents. Other machines suitable for this project include the White 2200 Multi-Tasker and the Singer 8673 Curvy. How do you go around the corners on the base without it puckering somewhat? @ sima - there is likely to be at least a little puckering. It will also help to stitch into each corner and stop with the needle in the down position, lift the presser foot to turn and adjust, then replace the presser foot and stitch the next side. I see other people have had problems with this. So it would really help if you could add some pictures on how you get to put the box under your presser foot and actually sew the top of the box and attach the binding. With the diagrams it looks super easy but so far I don't see it possible to squeeze a cardboard box under the presser foot even less sewing a binding to it. Well, after 2 days of trying with this box I give up! It went all quite well until I reached the step of sewing the top of the box. First I pinned all around the top of the box horizontaly, when I tried to sew it is was imposible! There is no way I can squeeze this box under the foot of my Janome 2030DC, I can only sew the middle (1.5 inches) of both long sides and that is all. I even have a second sewing machine which is smaller and got to sew a bit more than that but when I reached the corners is was imposible to turn the box so that I could continue the seam. I cannot even imagine attaching a binding to that and make it look acceptable. Can i use this same pattern if I have an already made canvas basket? @ Tammy Bigelow - I don't think it would be your best option to use an existing basket. This design is really best from the ground up. Adjusting all your sizing to fit what you have would probably take longer than just starting with new cuts. Thank you for your response . I am covering 16 canvas baskets with fabric for a freind but have searched the internet for an idea on how to do it . Do u know any patterns or an idea? I used your general idea sewing all the sides together . I think I have it figured out :) thank you ! @ Tammy Bigelow - hope it all works out That's a tough one to troubleshoot long distance - without being able to know what you're starting with. But - I'm glad we've been a little bit of help. Wow:D It looks cute and not so hard to make:D I was thinking of doing a box like that for a long time, but now I'm really motivated to do it. Finding the right size box to fit my shelves is impossible! This is a wonderful tutorial that meets my needs. I tried to post this once and it seemed to vanish, so I'm trying again. Sorry if there's a repeat! So far in these instructions I've caught two serious errors that I think may account for some of the problems people are having. The first is in how much fabric is called for. The directions say 1/2 yd for Fabric and and only 1/4 for Fabric B, but when looking at the actual pieces cut from each, MORE fabric is needed from Fabric B (for the binding strips). However, the bigger problem is that the bottom fabric piece is too small and referred to as two different sizes. In the initial instructions, it says it should be 7 1/4" wide and later, when it's being used, 7 1/2". However, if the finished dimensions of the box are supposed to be 7" on the short side, even 7 1/2" is not enough to give the 1/2" seam allowance asked for and 9 1/2" is a bit short too, allowing only 1/4" per side. I had to recut all my bottom pieces to 8x10" (which meant I had to go buy more fabric and waste all the original bottoms, until I can find a scrap use for them! Because my original fabric was on sale and normally quite expensive, I had to get cheaper fabric and my bottoms will now not match the sides) and then I could pin and sew the bottom easily as the directions say. I considered just folding the seam allowance underneath the bottom of the box and pinning the too-small bottom cuts to it at 1/4" and forgoing the bottom binding (wouldn't look pretty, but the bottoms are so rarely looked at anyway) but I decided I wanted to be perfectionist about it. Honestly, I would like to know how the people who made this exactly as directed got it to work--there was simply no way the bottoms would fit on and I triple-checked my cuts to be sure they were completely accurate. @ medinav - Both of your posts appeared. The first post is below as a reply to someone else's post. The binding is shown in the ingredients list as a third item -- in addition to the 1/4 yard of fabric. "Scraps for binding – you will need two strips per box, each strip is 1¾" x WOF (width of fabric). You can use either a contrasting fabric or a matching fabric: we used Patty Young's Anadalucia in Petal Jester (box 1) and Petal Floral (box 2)"
We are sorry if that was confusing. I read through the steps again (this is an old article... had to refresh my memory), and I can see how we might have caused some confusion in the Getting Started section by referring to "Fabric B"
(which is what we used for the sample) rather than scraps. I've made that change - thanks for the suggestion. Regarding size of the bottom, it should be 7½" x 9½". I'm not sure what to tell you other than these are the measurements we used for our sample. As with all our free tutorials, explanations and instructions on this website, these steps were published in good faith and had been reviewed for accuracy, however, we can't guarantee the exact results seen in our samples - the variables in materials and labor are too great. Thanks for replying! Yeah, I realize the binding strips can come from other fabric (I used scraps). I more meant that the other cuts are almost identical in size between A and B, but the fabric amounts called for are drastically different. I'm legitimately curious, though--if, as you said in another comment, the finished dimensions are supposed to be 7" on the short side, how do you get a 1/2" seam allowance on both sides out of a 7 1/2" piece of fabric? And I don't mean to be overly critical; generally, the directions are very clear and, though I'm having trouble getting my machine to go around the box corners cleanly, they're generally coming out quite well and I love the idea. Great idea. I'm making a few of these to corral my socks, undies, makeup, bath items...the possibilities are endless! If anyone is struggling with the corners, there's a good tutorial on design sponge. Wow, what a disappointing project. Harder than it looks, and I'm a pretty experienced craft sewer. Think I'll try one of the other ideas here. Too bad, I liked the sturdiness of the cardboard inserts. I don't think it's just you--I'm pretty sure there are some rather serious errors in the sizes of fabric cuts being asked for! The math just doesn't add up. P.S. It helped me to attach the binding to the top to turn my machine perpendicular to the edge of the table with the sewing end hanging off an inch or two, allowing me to turn the hollow end of the box around as I sewed. I also made a "pocket" for the inside bottom, and added a little loop to one edge so that I can easily pull the bottom out. Love the way mine turned out. I must admit, I had to finaggle the binding a little, but I think this is one of those things that, the more you do, the nicer they turn out, you just have to be patient. Thanks for the instructions! Love this so much, I sent the link to my crafting buddy. So many folks cover boxes and they look a bit "loose" - your fabric and carboard is so nice and tight, these boxes look wonderful. The trim on the bottom also nicely sets it off. Thanks for sharing. @ Holly @ www.abakershouse.com - thanks for sharing your success with these fun baskets. They look great! I love paisley. Thank you for the wonderful instructions and fantastic ideas. Can't wait to try more of your suggestions! Thanks! I was thinking of glueing mine on also. thank for letting me know it worked out for you. I do not feel like going out to buy a new needle lol. I figured glue the fabric to the bottome piece also. I'm using them as storage for kids toys- blocks, legos, crayons. I did buy plactic canvas as inserts so they will become washable also, wasn't sure how well it would sew on. This is perfect! I was looking for something to use in my bathroom on my shelves to corral/organize various bath products, and this definitely fits the bill. I won't be using cardboard, though. I'm worried the moisture in my bathroom will eventually cause problems. Instead, I'll be getting comething called Coroplast from my local art store. It's like corrugated cardboard, but waterproof! Thanks so much for the great idea! I needed something completely washable (my basket was going by the door for my towel for wiping off the dog), so I just left the top seams open (so I could slide the cardboard out) and created a removable liner for the inside with a 1.5" border that folded over. Then I didn't have to finish any edges (except an easy hem on the border) or cover the bottom piece of cardboard. Works great! I'm looking forward to trying this. We recycle our stuff for the Easter Bunny and set everything out on the table the night before Easter for him - but regular Easter baskets take up WAY too much room. So I'm going to make new Easter baskets from this pattern. We can fold them up when Easter is over....OR use the baskets to hold the plastic eggs and grass....and they'll look much prettier on the shelf. Ha! There's an idea I didn't see coming. Thanks so much! @ Khloe's mama - the corners are tricky, but this has been a super popular project that many folks have done with success - so I'm sure you can do it too . If you read through all the comments below, you'll see that several folks found using a fabric adhesive as a good way to keep the binding in place. Sewing with a zipper foot would also help you get in closer. I am having trouble with the corners on the bottom binding. I am not sure if I am doing it wrong? Or If my technique just isn't working. Can anyone help me with an easy way to do the corners! I love this box I use them for gift baskets for baby showers I go to and took the drawers out of an old dresser and replaced them with these it looks so cute in my daughters room! omg.. this is so much better then a diaper box. I had used a diaper box and covered it with fabric. not as sturdy as this thank you! Hi Jennifer LS, Adding compartments to this collapsible basket would be a whole new project. It's hard to think how you would do that with this pattern. You could always insert a purchased divider – maybe since you are thinking of using it for pens, see if you can find an inexpensive plastic compartmentalized box that suits your needs. We may do something with compartments in the future, but without the collapsible feature. Thanks for the tutorial it looks great. Do you know if I could add dividers to the inside? I would like it to have 9 squares inside to hold my markers. Any ideas would be appreciated. Thanks for the tutorial! I tried it out the first time today, but modified the dimensions to make a quarter circle box to fit on a corner shelf unit. One suggestion I have for the top binding is using small binder clips instead of pins to hold the binding in place. I believe I will use a walking dog foot next time to help with this step. I also didn't bother to stitch the bottom fabric to the cardboard; I used liquid stitch. All in all, I'm very pleased with the result. I only wish I had prettier fabric. Hi laurarj84 -- a couple folks below have recommended the crewel plastic you can find at craft stores or the corrugated plastic you can find at home improvement stores. Unless it was a super-stiff cardboard, almost like a chipboard, I don't know that I would trust cardboard to be rigid enough at a toy box size. After reading this through a good few times I am now ready to have a go! I can't wait. It's going to be a toy box for my little girl (10months), as she now has so many that the little tub she has is nowhere near big enough. So I will be scaling up. Do you think the cardboard will be strong enough for its use as a toy box? Any suggestions as to what I could use that might be stronger would be great. Thanks all! You can use a cardboard with more than one wave layer - those are strong enough to protect a refrigerator or washing machine:) Or you can insert two cardboard pieces to stiffen the walls of the box instead of just one. To make it really unbreakable, you should put one piece of cardboard vertically and another horizontally in each wall (I hope it's clear - waves should be in different directions). That way the box will be stiff in all directions. It will be thicker though, but I hope it'll fit. For a 10.5 x 10.5 x 11 inch cube (the exact size of the one's sold at Lowes to fit in the Cube Cubbies) cut your outer and inner fabric at 43 inches long by 12 inches wide. The bottom piece should be 11.5 x 11.5 square. Sections should be sewn at 10.5 inches, 5.25 inches, and 5.25 inches. This includes a .5 inch seam allowance for all sizes. As for anyone who's having difficulties sewing theirs, I suggest scooting your sewing machine so that the free arm pokes out over the edge of your sewing surface, so that the box can hang down next to your table. This gives you tons more turning room. The only thing I had trouble with was the corners, and the cardboard has just enough give that you can cram it through. One last thing, you can buy corrugated plastic from any home improvement store, and it'll make your bins last ages longer than regular cardboard, and they're easier to clean too! I love this - finally a way to have attractive affordable baskets on my shelves. 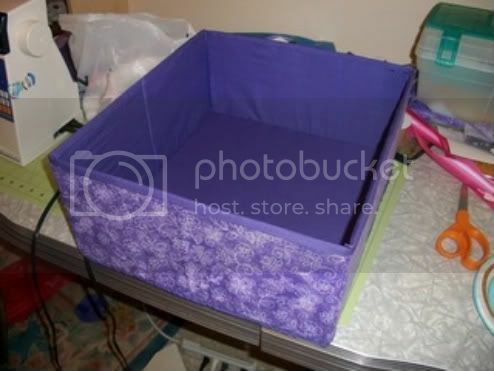 I've been using ugly plastic totes from the dollar store and wondering if I could cover them some how. Thanks for the pattern but like a couple other folks here it is not a simple one to do. I tried to change the size but ended up with more fabic for the side pieces than the bottom. Everything was perfect until it came time to sew it on. I'll try again with the size given to see where I went wrong. I did use the plastic used for crewel projects instead of cardboard. It was sturdy enough and can be washed without ruining the cardboard, plus it was much easier to sew with a stitch length to fit the holes in the plastic. BTW, Thank you for the tutorial. I'm looking forward to making these. I'm also looking forward to proving to My Guy that saving boxes (amongst many other things) does in fact save money and creates beautiful items through recycling! Hi rmhb - You can certainly try your idea of cutting back the cardboard; in theory it sounds like it could work. It really isn't very hard to stitch through the cardboard, and by having this stiffener go all the way to the top, it insures the binding won't be floppy. I'm sure it would still stand up fine and fold down fine as well with the slightly shorter cardboard panels. It just wouldn't have the nice, sharp corners around the top. This was AWESOME! I'm making these today for several areas of my house- my craft room, the nursery,and the bathroom to name a few with a few modifications. 1- instead of sewing the binding, I'm going to sew the bottom to the liner inside, and trim to 1/8", and use some fray-check to keep the raw edges from unraveling flip it to the inside and the put the bottom insert in. Voila- no need to bottom bind, and 2- different sizes for different areas. for example, I need 12x12 boxes in my craft area, 6x9's in my nursery and 12x7's in my bathroom. This is an awesome tutorial, and I can't WAIT to make these!! Thanks so much! Hi andrea rb -- sorry you are having some struggles; sewing in 3-D is always a bit of a challenge. If you scroll above, you'll see my suggestions to two other people who were having some trouble: answers are to "Angela Nicole" and "Susan10" ... the only other hint I have is to try switching to a zipper foot to allow you to get closer to the edge. I hope that helps! Im also having trouble with the top binding, im having trouble getting the box maneuvered around the sewing machine to sew the binding on. I cant see to figure out what i am doing wrong. I can get it under the foot to sew only the middle of each side and then i cant figure out how to go from there and do the corners. Anyone else have this problem while making theirs? Hi Heidi -- the long sides are 9", the short sides are 7" and the height is 6".